For the purists, the next, perhaps only, musical milestone for the UAE will be a Rock in Rio-style concert. But for those who still like to sip tea from porcelain cups and place their parking tickets under windscreen wipers, the first gentle rumbling occurred on Friday night at Burj Khalifa Park. Yanni in concert remains one of the great musical spectacles of our time and the ultra-charismatic Greek instrumentalist vowed 4,000 fans under the majestic setting of the world's tallest building. 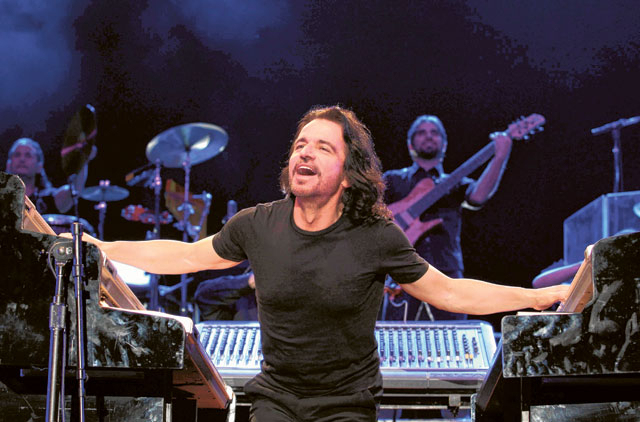 A self-taught musician who contradicts his 57 years, Yanni had the audience spellbound with his unique brand of contemplative instrumental music that is wrapped around highly melodic synthesizer keyboard playing. Yanni played a delightful two-hour set that featured most of the hits from mega-selling albums like Keys to Imagination (1986), Out of Silence (1987), In My Time (1993) and Tribute (1997). His already dramatic music was given even greater force by a wonderful entourage of musicians. Right from the opener, Santorini, one of the gems on Yanni's 1986 release Keys to Imagination, he shows that he is prepared to plunge into the rich heritage of his back-catalogue while ensuring that the songs retain their identity but acquire a certain freshness in their newer forms. Truth of Touch, a melodic piece from the album of the same name and his first in over seven years, makes way for the first highlight of the night — the ravishing Keys to Imagination. Featuring duelling violins by Samvel Yervinyan and the gorgeous Mary Simpson, Keys is a true masterpiece. Lusty, melodic and full of passion it befits Yanni's Greek heritage and almost brings the house down. Almost. Felitsa, a song written for his mother, is intimate and inspiring. 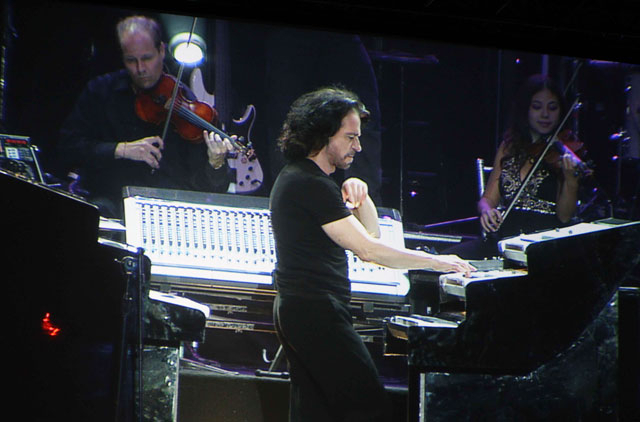 Playing an upright Yamaha piano Yanni uses structures and melodic textures that are both complex yet minimal, and suggest old-school piano playing. But with a difference. "Assalam alaikum, Dubai," brings the response it was meant to as the crowd go wild. "We're going to have fun tonight," says Yanni, his smile lighting up a stage swathed in blue and purple. "We came here hoping to take you away from your everyday lifestyle, even if only for a little while. And if we can achieve that, we would have succeeded." And as if on cue the band burst into Voyage, a flamboyant and extravagant song that could have been made in hyperspace. Watching Yanni and his band of musicians at work seems like film noir transferred to the concert arena, with lighting that is vibrant and gloomy at the same time. This was not an allusion, but a reality. Nightingale featured Lauren Jelencovich, a talented and deeply passionate vocalist who took the set into the rousing Marching Season, an up-tempo scorcher that saw Yanni at the top of his game and featured an entertaining drum solo from longtime associate Charlie Admas, proudly sporting an Al Wasl Football Club T-shirt. Among the other show-stoppers was the amazing Harp Solo by Paraguay's Victor Espinola before violinists Yervinyan and Simpson kicked up a storm in Within Attraction. As the two-hour concert drew to a close, Yanni took the microphone and asked: "You don't look like you want to go home tonight. Well, neither do we!" The crowd responded with a resounding "Yes" and the band rewarded them with the Cirque-sounding Ode to Humanity, a lilting aria featuring vocalist Lisa Lavie. The concert concluded with the funky Niki Nana, a Herb Albert-meets-Brand New Heavies kind of song, before Yanni returned for the first encore to play a three-song set punctuated by the brilliant Nostalgia before wrapping up with One Man's Dream played to a standing ovation. In short Yanni, Live at the Burj Khalifa, was a genuinely enlightening experience.